The economic crisis has hit the Western Balkans particularly hard. The region was hit hard in absolute terms, a result of half-hearted economic reforms and the elites denial over the economic crisis reaching the region (a number of government ministers across the region predicted that their country would be spared). The region was also hit hard psychologically as growth has been sluggish or started from such a low level that the perceived benefits by most citizens are limited. As a result the reservoir of patience is small. 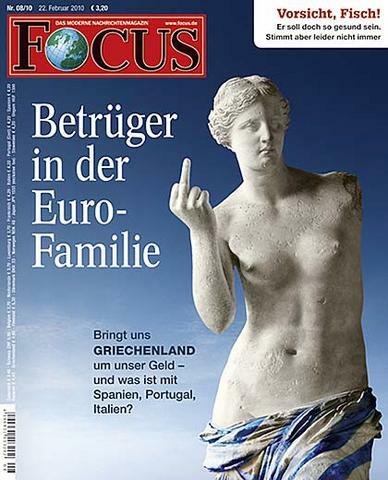 Cover from the German Weekly Focus "The Cheater in the Euro Family"
Who will benefit from the crisis? There are no clear winners or loosers. However, overall populism is likely to gain ground. Good evidence of this is the media exchange between Germany and Greece with German media going for some good old Balkan stereotypes and Greek media dragging out WW2 to counter German criticism of the Greek economy. While for the German media, Greeks are cheating, stealing Balkanites (which of course bodes well for the enlargement of the region), while Greek media like to draw parallels between the EU and NAZI occupation, as in the cartoon from Kathimerini below. In Bosnia, it seems to disadvantage the established nationalists, esp. in the Bosniak-Croat Federation, but might help new nationalist/populists, such as the tycoon Radoncic, who recently suggested that non-Bosniaks should not be working for the Federations public broadcaster. In Serbia it is likely to help the populist Progressive Party. While no elections are scheduled in the region this year except for Bosnia, governments are likely to adopt populist policies. At least at the moment, it does not appear that opportunity to clean up the act in terms of inefficient public administration is being seized upon. Unlike in Greece, the unions are mostly weak and fragmented in the region, so paralysis is unlikely to come from the streets. Altogether the economic crisis motivates political elites to claim political successes on other fronts: Unfortunately, this is unlikely to benefit the resolution of outstanding conflicts, from the name dispute between Greece and Macedonia to the relations between Serbia and Kosovo. In particular, the prospects of resolving the name issue between Greece and Macedonia seems as remote as ever. While the Papandreou government has been more pragmatic than its predecessor, it seems improbable that it has the courage to move a solution forward in the context of the deep economic crisis and faced with the fact that the leader of the main opposition party, New Democracy, is Antonis Samaras whose hard line over Macedonia called the downfall of the Mitsotakis government in 1993. The possibly most important aspect of the crisis is the policy of the EU. We have seen a serious erosion of solidarity among current EU members and the economic crisis in Greece is likely to disadvantage the countries of the region: Whether they are members (such as Bulgaria) and are now less likely to be admitted to the Euro-zone to countries in the Western Balkans, who are now likely to be scrutinized more extensively than they would have been before.